According to the London Telegraph, Tokyo Electric Power Co (Tepco) has announced that they will start construction of a shroud over the No. 1 reactor at the ill-fated Fukushima Dai-ichi power plant where a hydrogen explosion destroyed the walls and roof of the reactor building on March 12, the day after the cooling system was knocked out by the Japanese earthquake and the tsunami that it triggered. The shroud will stand 177 feet high and be 154 long with a roof that can be opened to give cranes access to the interior. It will also be fitted with filters that, over time, will scrub the air inside the building of radioactivity, enabling workers to enter the plant. The frame of the shroud will be put together off-site and once in place, it will be covered with polyester fiber panels coated with a resin designed to prevent further radiation leaking into the atmosphere – at least that’s the plan. Tepco is using the operation at the No. 1 reactor to test the construction methods and effectiveness of the shroud. In truth, they are not sure how effective the temporary cover may be in limiting emissions of radiation from the reactors and spent fuel pools, but it will at least prevent more rainwater entering the buildings and becoming contaminated with radiation. If it proves effective they have plans to build similar covers over the No. 3 and No. 4 reactor buildings, which were also damaged by explosions after the tsunami. 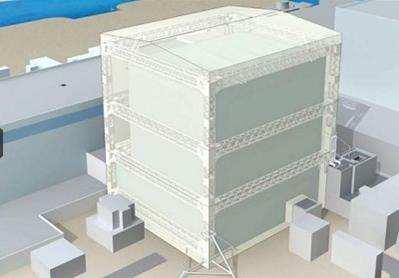 Eventually, Tepco plans to erect a concrete structure around the reactors, but that will take several years to achieve. A similar concrete sarcophagus was built over the remains of the reactors at the Chernobyl power plant after that facility was destroyed in an accident in April 1986. In hearings on Capitol Hill, the Senate Committee on Environment and Public Works was questioning the NRC’s chairman, Gregory B. Jaczko about the implications of Japan’s nuclear accident for the United States. A statement by a commission official on Wednesday indicated that the nation’s nuclear safety rules had failed to consider the possibility of losing both off-site power from the electric grid and on-site emergency diesel generators. NRC Commissioner George Apostolakis said that this condition produces a station blackout, and the commission has a rule covering such blackouts, but Mr. Jaczko said that the thrust of the statement was that the agency had not thought enough about a single event that would damage both the grid and the diesel backup generators, causing a plant to take longer to recover. Let’s hope the US is not the next country designing a sarcophagus for a nuclear facility.